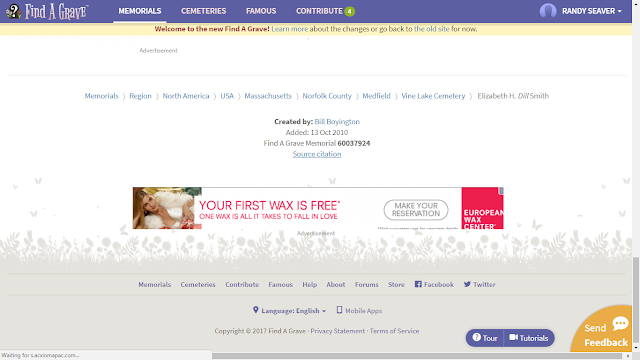 Find A Grave changed the look and format of their website earlier this month, and added some much-desired features. The most important new feature, for many researchers, is a source citation for a Find A Grave memorial. Here is the Find A Grave home page, with information to search for my 3rd great-grandmother, Elizabeth Smith (1791-1869) of Massachusetts. A source citation? Cool. I clicked on the link for "Source citation" on the screen above. 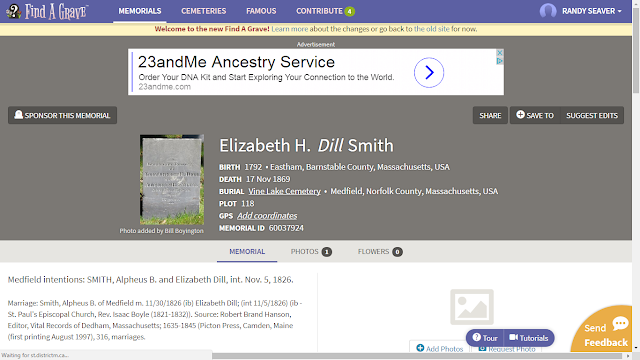 Find A Grave, database and images (https://www.findagrave.com : accessed 9 November 2017), memorial page for Elizabeth H. Dill Smith (1792–17 Nov 1869), Find A Grave Memorial no. 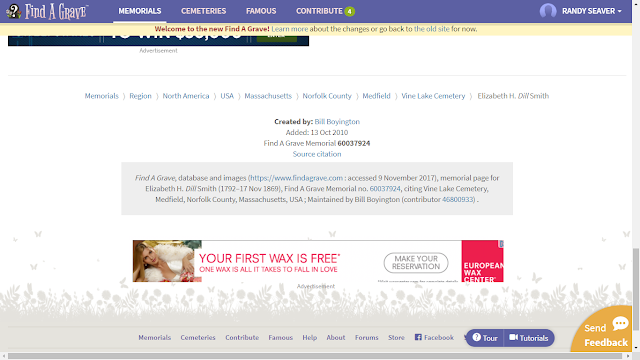 60037924, citing Vine Lake Cemetery, Medfield, Norfolk County, Massachusetts, USA ; Maintained by Bill Boyington (contributor 46800933) . I could copy and paste that into a source citation field in my RootsMagic, or other software program, and be happy with it. It's better than what I use now. 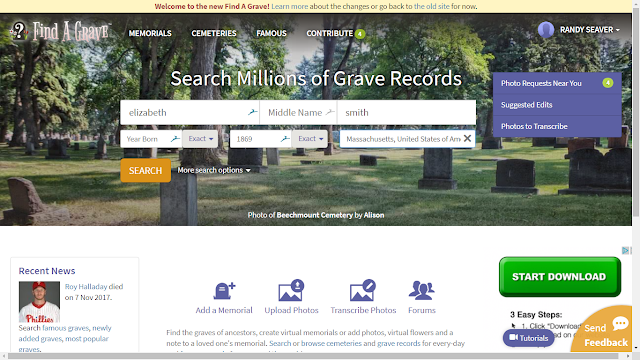 The problem is that I have over 20,000 citations to Find A Grave already and choose not to modify them at this time. The placement of the creator information and the source citation are all the way down to the bottom of the page and will be easily missed. They really belong after the Gravestone Inscription information and above the links to other memorials and the advertisements. And why not just put the source citation on the page rather than have to click another link? It's just formatted text. I opened the "Send Feedback" field and added this comment. I was skeptical about the new site at first, but I've found I really like it! I found that there is a specific copy button under the "share" section. That copies everything and the citation with it. Very nice feature, I just wish it was more visible! I also was skeptical about the changes, but admit they have improved many things on the site. So far the only feature I dislike is the way the results are listed. 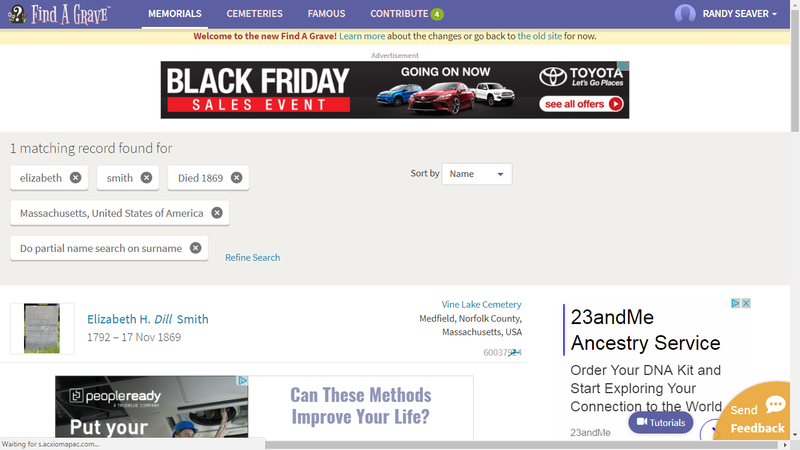 I have Smiths and Browns and I could scan a whole page of names at a glance before, now the font on new result page is too large and you have to scroll constantly. Thanks for pointing out this advantage to the new website. I'm still getting used to the way it looks, but at least I now have more of an incentive because the source citation has been vastly improved! Thank you Randy and also Renee for pointing out the ability to copy the data to the clipboard. Between the clipboard function, the citation and the ability to print the page to PDF (without any ads and with any photos) I've done a complete 360 on my opinion of the changes to this website. It's actually much better. It's too bad these features are sort of hidden from obvious view.